Select Diameter 1/8" 1/4" 3/8" 1/2" 5/8" 3/4" 1-1/4" 1-3/4"
Our PEEK expandable sleeve is designed for mechanical protection in extreme temperature and hostile environmental conditions. Rated to 260ºC (500ºF), It meets VW-1 flammability requirements. 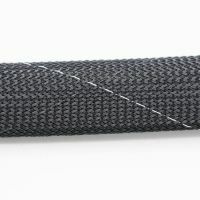 This expando PEEK cable sleeve open-textile construction makes it highly flexible and resistant to trapping water, heat and humidity. PEEK braided sleeved have low levels of flammability, toxicity, smoke generation, and hard vacuum off-gassing. Due to its high use temperature, the expando PEEK resists damage from high-temperature air guns used with heat-shrinkable elements such as strain reliefs, terminations, and identification sleeves. This product is a viable solution in aircraft, space, military, marine, and hostile-environment applications.